If you can count backwards from five, you’re sure to enjoy one of the freshest crime thrillers to come out of small town America since Fargo. From the opening moments of Shimmer Lake in which Rainn Wilson (The Office) lies prone on a basement floor, seemingly dead, only to wake with a gasp, grab a gun and then convince his young daughter to pretend she never saw him (when she comes downstairs to get some Fruit Loops from the pantry), I was officially on the bus. This Netflix original movie (shot in Canada) boasts an exceptional ensemble cast in an amusing deconstructionist crime thriller whose plot line ‘begins’ on a Friday in a small town and ‘ends’ five days earlier, revealing its deliciously twisty revelation. The story revolves around a bungled bank heist, a cool headed sheriff and his long suffering deputy, a bank president with a secret, and a prosecutor with a checkered reputation (who happens to be the sheriff’s brother.) How they are all connected proves to be a delightful jigsaw puzzle through and through. Just follow the money, as the saying goes. 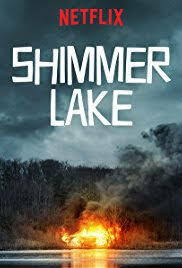 Shimmer Lake is the brainchild of writer/director Oren Uziel, rich in comic nuance while still serving up a richly dark morality tale whose components fall neatly into place by the end . . . make that the beginning. It’s a distinctly satisfying display of one town’s dirty laundry and an example of how universally soiled everyone’s hands can get, given the motive. Shimmer Lake is presently streaming on Netflix.